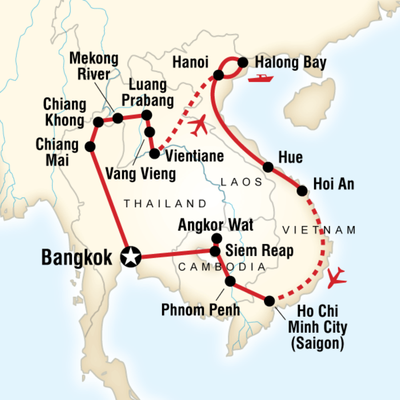 To ease ourselves into a life on the road, we've booked ourselves on a 29 day tour of Indochina with a company called G Adventures. We pass through northern Thailand, into Laos, Vietnam and Cambodia before heading back to our start point, Bangkok. Having just read 'First They Killed My Father' (thanks for the loan Kimberley), I'm keen to visit Phnom Penh, but seeing the Killing Fields first hand will undoubtedly be a very sombre and emotional experience. After the book, I appreciate so much more the horrors of Pol Pot and the Khmer Rouge's regime, and will feel extremely humbled to be standing in the area where such atrocities happened only 34-38 years ago. Particularly when my western life in the mid to late 70's was such an entirely different and safe existence. I promise our entries won't all be so melancholy but this part of our trip will be one of the more poignant encounters.